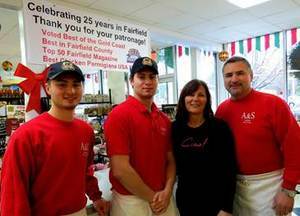 Fairfield, CT - A&S Italian Fine Foods, 2079 Black Rock Turnpike, Fairfield, CT celebrates 25 years of serving delicious food to greater Fairfield on Saturday, January 19, with a special anniversary recognition celebration and presentation at 11am. State Senator Tony Hwang will present a 25th Anniversary Connecticut General Assembly proclamation to Carmine and Doreen Battimelli and their sons, Giovanni and Donny, owners of A&S Italian Fine Foods, for their culinary expertise, outstanding customer service and invaluable contribution to the community for a quarter century. PHOTO: The Battimelli Family at A&S Italian Fine Foods in Fairfield, Carmine, Doreen, Giovanni and Donny.